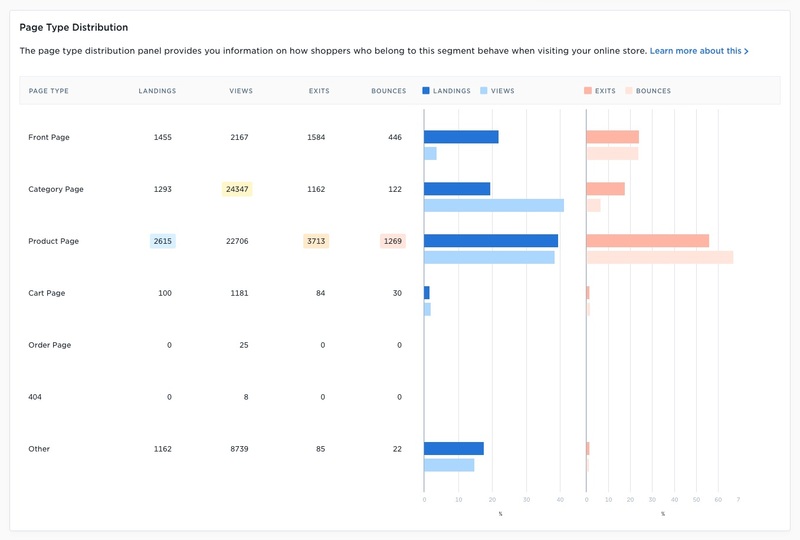 The page type distribution panel provides you with valuable information on how shoppers in a given Nosto segment behave when visiting your online store which can be used to inform Onsite Personalisation campaigns. Under Landings, you can explore how customers who belong to a given segment enter your online store. It accounts the total number of visits started on the corresponding a given page type in the selected time frame. The Views count provides you with the total number of page views of the corresponding page type in the selected time frame. The Exits datapoint provides the total number of exits from the corresponding page type. An exit is the event of an online shopper leaving the website without purchasing in the selected time frame. Bounces provides you with the total number of visits where one single page view has been observed in the selected time frame. Visits qualifying to be labelled as Bounces also qualify for Landings, Views and Exits. #1 - A customer starts their visit on a Product Page and leaves the website from the same page. Product page: 1 landing, 1 page view, 1 exit and 1 bounce. #2 - A customer starts their visit on a Category Page, clicks on a product and visits the associated Product Page. They then click on a product suggested by a cross-selling recommendation slot and visit this Product Page. After viewing the second product, the customer then exits the online store from the second product page. Category page: 1 landing and 1 page view. Product page: 2 page views and 1 exit. A page view is an instance of a page being loaded in a browser. Read more here. Nosto counts one page view whenever the Nosto script is initialized. A bounce visit is a single-page session on your site. Read more here.